Onslow is a coastal town 1,386 kilometres (861 miles) north of Perth. 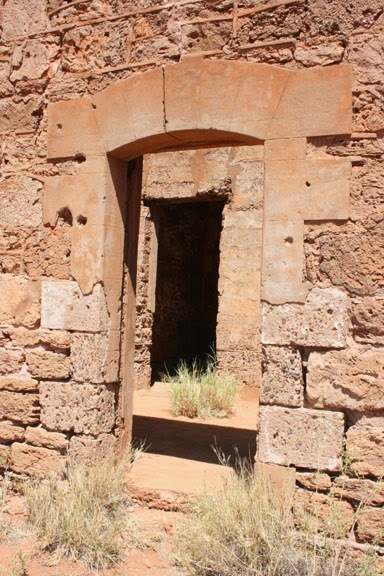 It has a population of around 573 people. It was founded in 1883 as a port at the mouth of the Ashburton River for exporting wool from the sheep stations of the Pilbara hinterland. Although a large jetty was built at the original site of Onslow, repeated damage whenever a cyclone hit or the Ashburton River flooded led government officials in Perth to establish a new town well away from the river after another cyclone in January 1925. 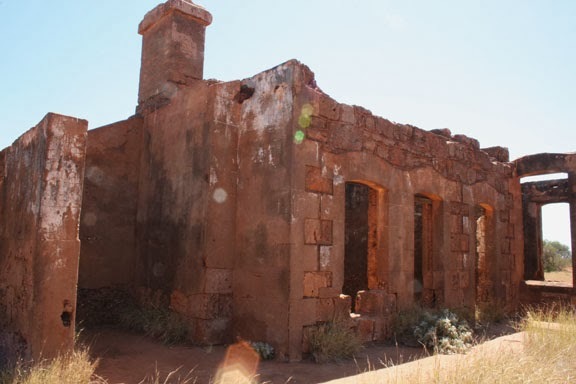 During World War II, Onslow was the most southerly town in Australia bombed by the Japanese. Old Onslow Goal - There was no way I was going in there - not ghosts SNAKES! 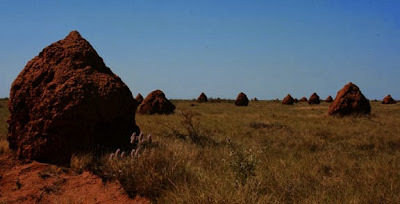 Onslow is another area in Northern Australia where there are a lot of termite mounds. There sure must be a lot of termites in northern Australia!! ﻿Industry in Onslow these days in on a huge scale as it is in the rest of Western Australia. 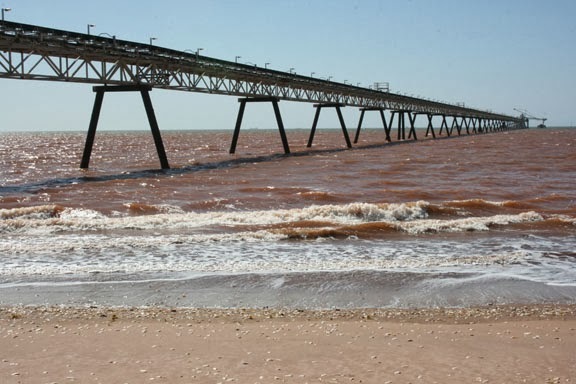 The Wheatstone Project involves transferring gas from offshore platforms to the gas plants just out of Onslow and somehow using it as Liquefied natural gas and domestic gas development. We were talking to some fellas today who work for Wheatstone. They are what is called FIFO (Fly In Fly Out) and work 10 hour days for 4 weeks, then fly home for 1 week. Their wages are approx. $3500 per week clear, that’s what they get in their pocket!!! That’s probably why the average house price in this area is $900,000 and rent is around $1900 per week. Onslow is also another location that has a huge Salt Industry. 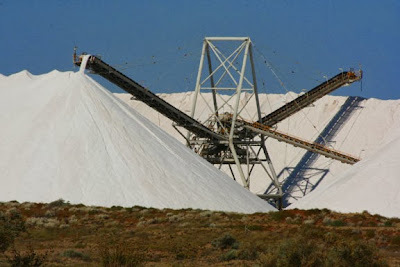 I find the salt mining process very intriguing. From what I have read Onslow Salt is owned by a Japanese company Mitsui group. 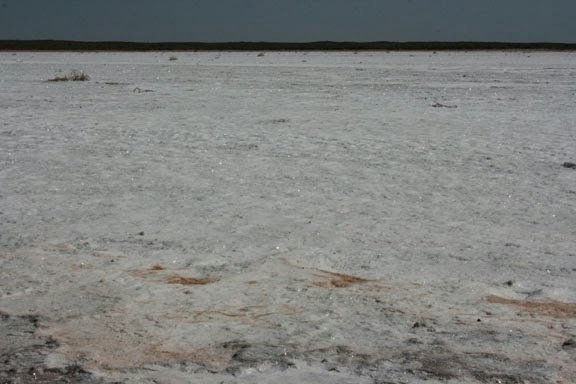 Mitsui's salt farms produce some of the highest quality solar marine salt (sea salt) in the world. Their fields are also ideally located to export bulk shipments to Asian markets. along this jetty and loaded onto the ship. Why is the water so brown you ask? Not really sure but I was told that it is from the sea bed being dug up for the gas pipeline. Very interesting place this Onslow is.Liquified gas and salt....a different combo for sure. I bet they have no problem finding people to work there with that kind of pay-cheque coming in!!! Davine, you must be very used to 'living on the road' by now. It may become part of you! Next stop/adventure.....North America!! !